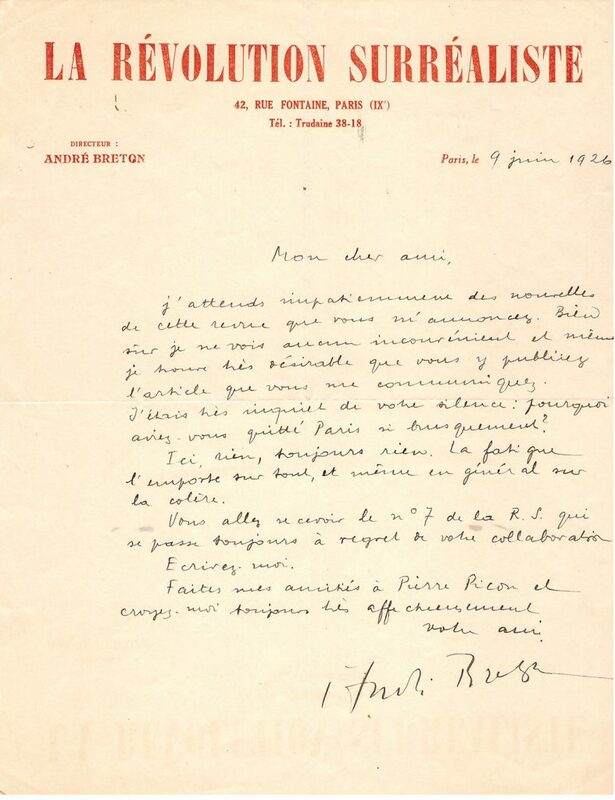 Find of the Week - Letter by André Breton | What is it worth? This week’s find is a witness to art history. Written by the founding father of Surrealism, French writer André Breton, this letter was addressed to writer Jean Carrive, one of the prominent members of the Surrealism movement. Writing on a page from the Surrealist Revolution journal, Breton expresses his eagerness awaiting the news of the review announced by Carrive. “(…) Of course I do not mind and even I find it very desirable that you contact me about publishing the article. I was very worried about your silence, why did you leave Paris so suddenly? Here, nothing, still nothing. Fatigue overrides everything, and even generally on anger (…).” The intimate and friendly tone of the letter stands as a witness to the close relationship between two great minds, passionate about the same ideology: Surrealism. Their friendship started with a letter, when an admiring Jean Carrive, only 15 years of age at the time (1920), wrote to his idol André Breton, who fascinated him. Born into a modest family like Breton, Jean Carrive had a deep love and insatiable predisposition for literature from an early age. Breton saw the talent and exceptional mind in this boy and invited him to Paris in 1923 and the following year included him in the 19 disciples of the Surrealist Manifesto, alongside Aragon, Crevel, Desnos, Soupault etc.. Somewhat comparable to the Apostles of Christ, these people have “performed acts of absolute Surrealism“, by which he possibly means the pure psychic automatism, the main principle of Surrealism. In a state of pure psychic automatism, the writer or artist closes the conscious mind and lets the unconscious completely take over the creative process. This letter is one in a unique set of 16 between Jean Carrive and André Breton, from 1923 to 1933. A big discovery for the market of Surrealist books, these are going under the hammer at Parisian auction house Tajan on November 17. The Surrealist Library auction also includes letters from other famous Surrealists to Carrive, typescripts by Carrive about his work of translating and analysing Kafka‘s works. The session will also feature a drawing by Pierre Klossowski of his good friend, “Portrait of Jean Carrive”, and a rare drawing of his famous brother Balthus.